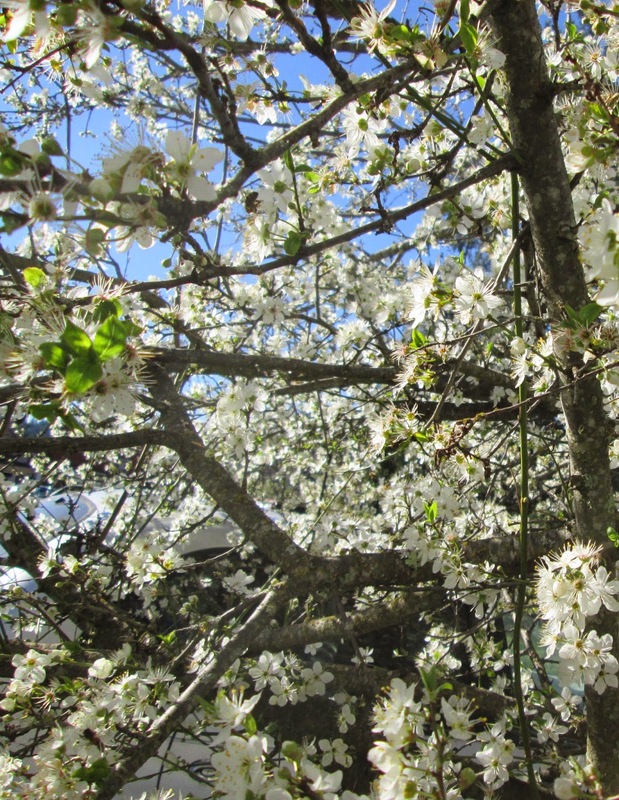 Walking under the newly blossomed plum trees, watching the happy bees of this false spring, I found myself recalling a fragment of a poem I wrote maybe 30 years ago. Possibly more. I don’t even recall the rest of the poem, which likely sits in one of my crumbling notebooks and in published form in some literary or academic magazine. Well, I could spend time sorting through the hundreds of poems to figure out where the fragment fits, what I was thinking, when it really was. Maybe I’ll do that. Probably not. The words are “impermanence alone is fixed”. And sure, I know what I meant. We live in a world of rise and fall, of turns of the seasons, turning of the wheel. Beautiful things happen. Bad things happen. The white plum blossom drifts down like snow, and then there may be hard green nubs, and then sweet yellow or red or purple fruit, drawing the wasps, staining our mouths, sticky on our fingers, luscious to our tongues. In the old days the news that ripped our lives apart came in letters & in phone calls & in people standing stiffly on the doorstep, faces fixed in a polite and terrible calm. These days—perhaps a text message, a quick pixilated private message, a scrap of news, may turn the world over. The trees keep blooming. I think you have to figure out what’s important. The flowers are here briefly. And so are we. I told him I’d read some précis of his research. “I like rocket ships,” he said, “but I wouldn’t want to learn to build one”. I did not say that the health of my youngest child was of grave concern to me and not really like a hobby. I figured he knew that. I said I felt better when I had as much information as possible. I don’t know how he took that; he promised to always be honest with me. Well, okay, that’s cool. And we liked him, and his pretty ring, and his stories of England, and his firm disapproval of surgery for this particular case, this particular person, this being I held in my arms when he was born, drenched in wonder and exhaustion, his siblings and papa right there. It’s a fragile place, you know, a top of the line medical research center. People rush about with internal calendars. Memories are just below the surface. Hope trembles on the lips and in the eyes. Hard to keep centered, sometimes. But that’s the trick, in the turning wheel and the upheavals, in news from far away and tragedies in our front yards and aching hearts and aching legs. Once I was a little girl, playing with imagined friends, my fine pale hair in my eyes. Once my children played under the falling blossoms. Once, well once upon a time I trusted nothing would ever hurt. I’ve seen deaths, and loss, I’ve lived through a lifetime of wars and damaged souls. People and things have slipped through my fingers. They’ve been lost. I can’t rescue them, I can’t just break out the unicorns and dances, though I would love to. I’ve stayed up, haunted, through many a long night. And I wouldn’t have missed it. And…well, in the moment, the air is sweet. The bees have gone into their hives for the night. Some I love are dead, some are far from me, but right here the cats are purring, my littlest kid sits with his papa, the dog is smelly and loyal and content, and life goes on. Sending love to Gabe and you and all your loved ones. Thank you for writing and for the healing image of the tree blooming into the blue sky in February. Wonderful writing. And so much hard won wisdom woven through it, as ever dear friend. Impermanence... Requiescat in pace, Kathy... Regretting that I have not been here to visit in a long while.